Better known for super-accurate scale model motorcycles and trucks, Dutch builder Bricksonwheels has decided to try his hand at a train. And not surprisingly, the result is spectacular – and also huge! 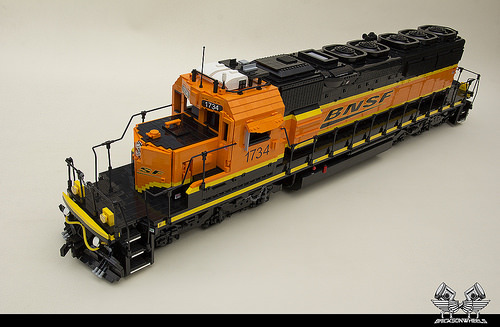 At 1.31m in length, this model EMD SD40-2 freight locomotive required months of building and approximately 20,000 bricks to complete. It was built at 1:16 scale …which I suppose technically puts it in the “rideable” 3/4 inch scale Live Steam gauge! It will also be featured in an upcoming book on LEGO scale model building by No Starch Press.